Last week in the Ladies League we start with the hotly anticipated top of the table clash between Port St Mary and South Ramsey. The re-arranged fixture took place on Thursday and Castletown A would have been keeping a close eye on events to see how their lead over the two teams would be effected. Earlier in the season South Ramsey defeated Port St Mary 154-130 (5-4) and on paper this was to be another close affair. Katy Williams got Port St Mary off and running with a 21-8 win over Bethany Kennish. The other four matches from the first half were shared with both sides winning two. Ann Maddrell suffered a rare home defeat as Lyn Bolton just had the edge in their game to win 21-20 and South Ramsey’s second win came from a 21-18 win over Kellie Maddrell-Reeve. Port St Mary responded with Val Macfarlane beating Jill Quayle 21-19 and Wendy Kennuagh who had an excellent result beating Jenny Moore 21-15. Port St Mary took a lead of 17 chalks into the second half. The second half Port St Mary dominated winning all four games. Trish Bull defeated Fiona Kennish 21-14, Margaret Tasker beat Sue Collier 21-13, Chris Price beat Kim Hargraves 21-5 before Jayne Kneen became only the second person to beat Elaine Moore in the league this year with a fine 21-12 win. The final score was 185-123 (7-2) with the home team winning by an impressive 57 chalks and extend their winning run to 13 matches. Thursdays result also took them 83 points clear of Castletown A and with only five games remaining, Port St Mary look to have taken control of the league. On Friday the bad weather returned postponing four of the six fixtures. Castletown A vs Purt Le Moirrey was one of the fixtures which was able to be played and allowed Castletown to temporarily return to the top of the league following their third full house of the season. The match ended 189-79 (9-0). Five players won to single figures with Kim Foy beating Roma Ware 21-4, Kath Kinley beat Debra Cooper, Heike Perry beat Linda Dawson 21-4, Tracy Moore beat Pauline Worrall 21-7 and Marie Ashurst won 21-3 against Chris Holland. In the remaining matches Ann Hollingworth beat Dot Mylchreest 21-11, Hanna Drewett won 21-12 against Brenda Hawkard, Anne Oates beat Mavis Franks 21-19 and merit leader Amanda Lawler won 21-19 against Edwina Reid. The only other match to take place was Peel Sunset against Port Erin with the home side winning the match by 26 chalks. 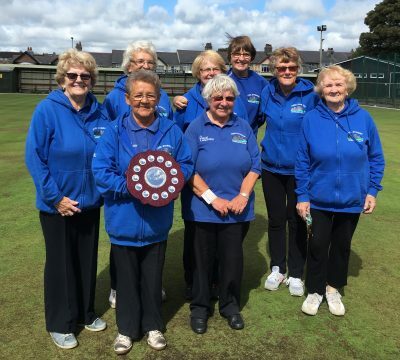 Peel won six games with Heather Horsburgh beating Jean Thackrah 21-10, Sue Jones won 21-17 against Jenny Cain, Joyce Kelly won 21-11 against Lynda Cadamy, Mary Moffatt won 21-4 against Voirrey Curphey, Cath Parker beat Susan Inch 21-17 and Lynda Wilson won 21-5 against Phil Dobson. Port Erin’s three winners were Caroline Whitehead winning 21-7 against Shirley Corrin, Jacqui Elliott beat Pat Robertson 21-8 and Carol Kaye beat Gill Clarke 21-8. The final score was 153-127 (6-3). After this weeks matches Castletown A may sit top of the league but are only 106 points ahead of Port St Mary who have a game in hand and average over 172 points per game this year. South have played the same amount of games as Castletown and trail them by 54 points. As we enter MGP fortnight there are a number of rearranged matches before a full set of fixtures at the end of race week. There was an entry of 34 pairs for the Derek Killey Memorial held on Sunday at Onchan Bowling Club. 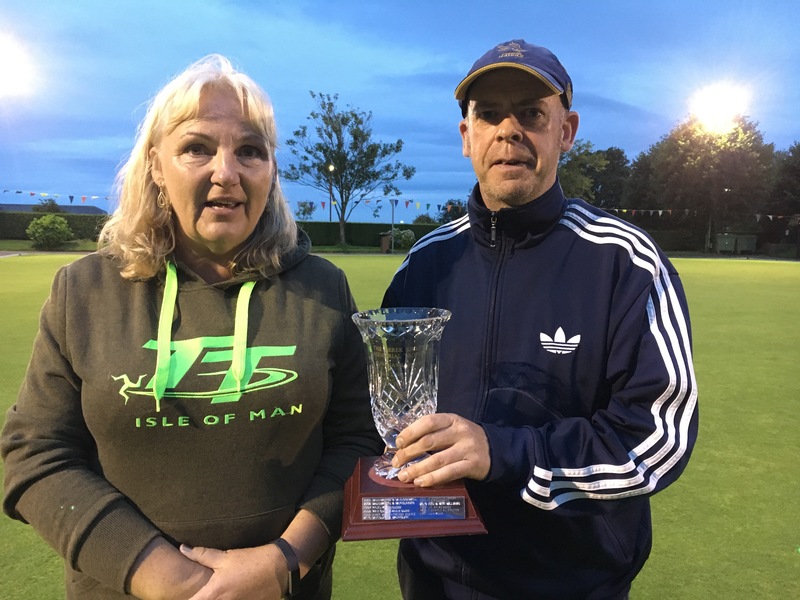 The eventual winners were the South Ramsey/Port St Mary duo of Lyn Bolton and Trevor Quayle who beat the South Ramsey pair of Jenny Moore and James Teare 21-7 in the final which was played under the floodlights. Losing semi-finalists were the home pairing of Sue Gawne and Rob Cowley, along with another South Ramsey pair Kim Hargraves and Stefan Kelly. The presentation was made by Kevin Quirk who thanked Eileen Killey for the continued sponsorship of the competition held in memory of her late husband Derek Killey who was a popular member of the bowls community. Thanks were also given to the club members who had helped officiate and provide refreshments throughout the day. Libby Andrade was then introduced to present the prizes with the finalists generously handing back their prize money to add to the total amount of over £500 raised for Alzheimer’s IOM. 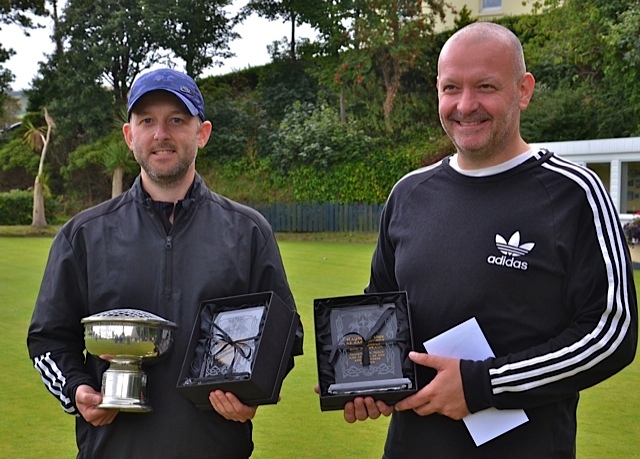 Saturday 18th August saw the Mannin Hotel Douglas Town Cup being held by Douglas Bowling Club at the Villa. With both Ladies and Men’s Singles being played side by side this Competition promised some good bowling and those watching were not disappointed. We saw some great bowls straight from the start and in the first round of the Ladies Event we saw two epic battles with Lyn Bolton just edging out Paula Garrett 21-20 and Philippa Taylor losing out 21-18 to Jenny Moore despite a valiant effort to come back from trailing early in the game. At the Quarter Final stage Janet Monk beat Jenny Moore 21-12 and Lyn Bolton went down 21-13 to Amanda Lawler. Debbie Leece beat Maureen Payne 21-8 and Margie Tasker took a victory 21-16 over Kim Hargraves. In the Semi Finals Janet Monk who always plays the ‘Villa Green’ well beat Amanda Lawler to 13 and Debbie Leece played well to beat the experienced Margie Tasker to 12. In the Final Debbie Leece started well and at one point had a small lead but in the end the extra experience of Janet told and she came through to win 21-15 in a game that was a credit to both of them. The Men’s Competition was better supported and the early rounds saw some good bowling and as we got to the Quarter Finals we saw young Sam Aherne have a tough draw against Neil Withers with Neil running out with a 21-10 win whilst Rob Monk defeated Harry Barton 21-14. Glynn Hargraves beat Alec Taylor to 12 and in a tough game Alan Moore squeezed past Andy Cannell 21-19. The Semi Finals saw Neil Withers beat Rob Monk to 14 and Glynn Hargaves beat Alan Moore to 13 to set up an epic Final. In a great Final it was hard to predict a winner and it was a close battle all the way with great bowls from both men with Neil eventually taking a 21-18 win after an exciting game. In his ‘Winners Speech’ Neil thanked the sponsors ‘the Mannin Hotel’ and all who had helped on the day, he also mentioned the excellent Green which although a bit heavy at the start because of the rain was running well at the end of the Competition. The JMS Veterans Shield Final took place on Thursday 16th August at Finch Hill Bowling Club with Peel Sunset facing Port St Mary B. Port St Mary B will start with a 20 point handicap. Peel Sunset compete in their third JMS final having won the competition once in 2014. Port St Mary B will take part in their first final. Peel Sunset made inroads into the handicap winning the first three games as Pat Robertson beat Chris Holland 21-11, Joyce Kelly beat Pauline Worrall 21-6 and Cath Parker defeated Edwina Reid 21-11. Peel after these three games had wiped out their handicap deficit and built a strong lead of 15 chalks. In the back three games Port St Mary faired better winning two of the three games as Mavis Franks beat Lynda Wilson 21-10 and Brenda Hawkard just held on to defeat Heather Horsburgh 21-20. These wins could only reduce the gap to three points, and with Mary Moffatt dominating her game and winning 21-11 against Roma Ware the victory for Peel Sunset was sealed with an overall 11 chalk win 114-103 (4-3). Thanks go to Finch Hill for hosting the final and to Janet Latham for her continued sponsorship of the competition. It was only the second double week of the season in Ellan Vannin Fuels division one this week with the positions at the top and bottom becoming a lot clearer. Champions South Ramsey A had a good week starting with a 10-0 win at home to bottom of the table Douglas B. For the visitors Pat O’Donohue lost 16-21 against John Kennish, whilst Grahem Moore was 9-1 up on Glynn Hargraves before losing 15-21. On Wednesday evening South Ramsey A had a much tougher fixture away to Onchan A on a wet night, despite this the Onchan green played well with the rain mostly holding off for the duration of the match with some good comebacks from both teams. For Onchan Phil Kerruish was first off winning 21-15 after being 7-10 down to go 20-10 up, with Grills taking five singles to get back to 15-20 before Kerruish got in to finish the game. Stefan Kelly replied for South Ramsey after taking a 10-4 lead against Steve Crampton with Crampton getting back to 17-18 before Kelly finished with a single and a double to win 21-17. Glynn Hargraves was next off for the visitors recovering from 5-9 down against Kevin Quirk to take a 19-12 lead. Quirk picked up five points over the next four ends to pull the score back to 17-19 and was lying one before Hargraves got back in to finish the game with two singles to win 21-17. Perhaps one of the best comebacks of the night was the game between Peter Slinger and Dido Kelly with Slinger taking a 15-5 lead only for Kelly to take 14 points without reply to go 19-15 up. Slinger then staged his own mini comeback to take the next four ends scoring six points to run out winning 21-19. Kelly would have been disappointed at playing a poor end at 19-15 up and then having opportunities on the next two ends to get back in. The match could not have been any closer at the halfway stage at 2-2 and the chalks tied at 76 each. In the second half Rob Monk helped Onchan’s cause performing well to win 21-6 against Peter Collister. John Kennish responded with a 21-12 win over Jordan Cain, with Cain doing well to reach 12 after being 2-13 down in a game which had several tight ends. David Bradford was another who dug in for his team to pull off a good comeback against Matthew Quirk who performed well despite eventually losing out. Quirk was 14-6 up before Bradford ‘edged’ his way back into the game playing the edge along the shelter side of the green to take the lead 18-16. Quirk replied with three singles to retake the lead at 19-18 with Bradford getting back in playing a good bowl to level up the score 19-19. Bradford then played two good length bowls on the last end to take a double to secure a 21-19 victory with his experience seeing him through a tough game. This left Alan Moore needing to win 21-16 or better against Mark Kelly to secure the aggregate for the visitors, with Moore doing just that winning 21-11 to secure the aggregate by just six chalks (145-139). South Ramsey came away with a 7-3 win knowing they had been in a tough game against an Onchan team that performed well despite the loss. Marown picked up two wins during the week, however slipped three points further back on the league leaders South Ramsey. On Monday night the Crosby men won 7-3 away to Castletown A with Peter Oates, Juan Kermode and Jordan Drewett beating Peter Kelly, Matthew Keggen and Phil Kelly respectively. On Wednesday evening Marown had a tough looking home fixture against Peel A, however they still managed to take a 7-3 win with Paul Dunn and Colin Kelly winning 21-8 against David Proctor and Frank Watson respectively. Dean Kipling won comfortably 21-11 against Mick Kavanagh, whilst Peter Kelly did well to beat Peel captain Stevie Kelly 21-18, with Paul Kelly beating Tom Kelly to the same score. Winning for Peel were Dave ‘Barney’ Kelly who beat Neil Withers 21-16, with Tommy McMeiken beating Matthew Keggen to the same score and Jerome Surridge defeating Phil Kelly 21-17. South Ramsey B will have been pleased with their weeks work despite losing 8-2 away to Marown B they managed to beat Douglas A 6-4 at home. The result on another night could have ended up 9-1 to the Ramsey men with Sid Bolton, Steven Waters and George Brew all losing 19-21 to Jimmy Sansom, Gary Conwell and Shaun Seal respectively. Austin Hart recorded his second league win of the season defeating Ian Moore 21-13, with good wins from Tony Dugdale, Ben Dugdale and James Teare. Port Erin A now need a minor miracle to stay up having picked up five points following an 2-8 away loss to Peel A and a 3-7 home defeat against Marown B. The Breagle Glen team are 13 points from safety with three games to play, one of which is away to the team closest to them South Ramsey B.
Douglas B picked up just one point this week and are certainties to be relegated to the second division. In division two it was very much a case of as you were at the top with both Noble’s A and Castletown B taking 14 points each with both teams picking up the points with differing results. Noble’s A won both of their fixtures 7-3 starting the week with a home win over Onchan B that could have been 9-1 with Glenn Boland losing 19-21 to Mike Alexander and Mark Quinn also missing out 18-21 to Colin Spence. Noble’s ended their week with a good away win against Peel C, with David Quayle, David Pease and Tommy Collister all winning close games. Castletown B started their week with a 6-4 win taking the aggregate by just six chalks. Alan Phair missed out on winning an extra point for the visitors losing 20-21 to Brian Colquitt. In their second fixture of the week Castletown beat Onchan B 8-2 bettering the result that Noble’s had recorded against the same opposition on Monday evening. At the other end of the table Port St Mary C look to be safe on 73 points having picked up 12 points during the week helped by a 9-1 home win over the side closest to them Noble’s B. Things don’t look so good for Port Erin B who are firmly rooted to the bottom of the table on 50 points and facing a return to division three, with Noble’s B looking likely to suffer the same fate, currently sitting 22 points from safety with just three games to play. In division three Marown C continue to set the pace at the top of division three following two good 7-3 wins, away to Peel D and at home to Douglas C.
Castletown C are hot on their heels, sitting just three points behind Marown despite giving a number of walkovers throughout the season. It was great to see Nathan Cooil back playing league bowls with Cooil showing he has still got it with two single figure wins, winning 21-2 and 21-9. Another three points back on Castletown are Ballaugh B who have a game in hand on the two teams above them, which they could well use to return to the top of the league if they record a big win. Two of the junior players performed well this week with Peel D player Ryan Tate winning both of his games, with Ryan Hargraves doing the same for South Ramsey D. Both players have improved this year, as shown in their improvement not just in winning games, but their overall scores. The week started with two re-arranged matches as Douglas took on Ballaugh and Nobles facing Purt Le Moirrey. Douglas beat Ballaugh 166-122 (7-2) with Harley Garrett, Maureen Wilcox and Shantelle Thorpe all performing well winning to single figures. Ballaughs winners came from Gill Dixon and Elaine Fenton. Nobles put in a strong home performance to beat Purt Le Moirrey 181-137 (8-1). Joyce Ogden top scored on the night beating Linda Dawson 21-9. Purt Le Moirrey pushed Nobles in a couple of games with Rita Callister just losing 21-19 to Alison Keggen and Mavis Franks losing 21-19 to Jan West. Purt Le Moirrey did avoid a whitewash with Roma Ware beating Rebecca Teare 21-13. On Friday 10th August Port St Mary took on league leaders Castletown, with Castletown looking to extend their 115 chalk advantage. Port St Mary have a game in hand and would look to close the gap before their catch up game next week. The game was finely balanced with both sides evenly matched and with a stand out performance from Ann Maddrell who won 21-1 against Sue Peach made sure that the home side won the match, ending Castletown’s impressive 14-win streak, and clawed vital points back on their rivals. Port St Mary’s other wins came from Val Macfarlane 21-15 against Kim Foy, Katy Williams 21-14 against Heike Perry, Trish Bull 21-19 against Anne Oates and Chris Price who beat Hannah Drewett 21-16. Castletown’s winners were merit leader Amanda Lawler who beat Wendy Kennuagh 21-12, Ann Hollingworth 21-12 against Kellie Maddrell-Reeve, Kath Kinley 21-18 against Jayne Kneen and Tracy Moore who beat Margaret Tasker 21-15. With the match ending with a 13 chalk with for Port St Mary, 162-149 (5-4), they close the gap to 102 points and will look ahead to their fixtures next week when they have another crunch tie against South Ramsey. With the game against South Ramsey their catch up game Port St Mary will then look to pick up vital points against Onchan on Friday. South Ramsey go back to the top of the summit following their 79-186 (1-8) victory over Castletown B. Jenny Moore, Fiona Kennish, Lauren Groen, Elaine Moore and Lyn Bolton all won comfortably to single figures. Castletown avoided a whitewash with Joy Stephens holding off Sue Collier to win 21-18. The result places South Ramsey 109 points ahead of Port St Mary with their match to come on Thursday 16th August. Port Erin collected their first full house of the season defeating Ballaugh 189-96 (9-0). Di Benson, Caroline Whitehead, Voirrey Curphey and Lynda Cadamy all won to single figures in the match. Douglas nearly pulled off a great win at home to Marown but fell four chalks short losing 155-159 (4-5). Paula Garrett won 21-8 against Ceila Joughin backed up by Muriel Cain, Maureen Wilcox and Sue Caley. Marown managed to get over the line 21-20 in two of their games with Rosie Winckle defeating Helen Murphy and Philippa Taylor beating Wendy Cowin. Marown players Mary Alderson, Lil Smith and Margaret Scarffe were the other winners giving Marown the edge on the night. Mooragh Park travelled to Onchan and returned North with a five chalk victory with the away side also winning five of the nine games. Janet Monk, Vicky Lloyd-West, Julie Reilly, Madison McMullan and Helen Martin, who won 21-4, won for Mooragh Park. Onchan players Dee Lewis, Libby Andrade, Marylin Ellison and Sue Gawne won but were unable to prevent the team from losing 152-157 (4-5). Looking ahead to next week Port St Mary vs South Ramsey could be a pivotal point in the season for one of the sides. South then sit out on Friday, their match against Douglas re-arranged to a later date due to players representing the island in a competition on the mainland. Onchan produced a fine home performance on Tuesday to shock Peel Sunset and restrict them to under 90 chalks for the first time this season. Peel have been within sight of their first Over 60s title but Onchan pulled off an 11 chalk victory which could prove costly in the title race. In a low scoring game both teams won games to single figures with Lynda Clarke and Libby Andrade winning 21-7 for Onchan. Peel’s Mary Moffatt won 21-8 and Joyce Kelly won 21-4 to cancel out Onchan’s win’s. Jean Quine held off Pat Robertson to win 21-19 but Maureen Payne proved the difference winning her game 21-12 against Lynda Wilson. The final score finished 96-87 (4-2). Marown defeated Port St Mary B by a comfortable 22 chalks winning five of the six games. Mary Alderson, Philippa Taylor, Shirley Whelan, Celia Joughin and Margaret Scarffe all won for the home team. Mavis Franks made sure there was no whitewash with a 21-13 win over Mia Moore. The match finished 118-96 (5-1). Nobles picked up their fourth win on the trot coming out on top by 11 chalks against Port Erin A. In a tight game Nobles won five of the six games but were pushed all the way in the games. Carol Kaye was Port Erin’s sole winner defeating Sylvia Kennuagh 21-16. Final score 121-110 (5-1). Castletown travelled to Breagle and returned home with a strong 69-124 (1-5) victory. Breagle had to concede two games with Marie Ashurst, Barbara Young and Ann Hollingworth won for Castletown. Breagle avoided a whitewash through Kay Primrose-Smith who beat Joy Stephens 21-19. In the final game on Tuesday South Ramsey collected their second full house of the season with their 52-126 (0-6) defeat away to Mooragh Park B.
Thursday 9th August saw a return to form for Peel Sunet with them beating Nobles 118-86 (5-1). Lynda Wilson won 21-9 and Joyce Kelly 21-4 to setup a big points victory for Peel with Nobles Sylvia Kennuagh preventing a full house by winning her game 21-13. Port St Mary B took on Breagle and collected a fine full house victory 126-55 (6-0). Roma Ware and Pauline Worrall both top scored winning 21-7. Castletown picked up their third win on the bounce beating Onchan by 19 chalks. Ann Hollingworth won 21-4 and Anne Oates won 21-5 to build a comfortable lead for the home side with the match finishing 110-91 (3-3). In the final match from Thursday Mooragh Park A produced a strong home performance to beat Marown by 17 chalks and winning five of the six games. Janet Monk defeated merit leader Philippa Taylor 21-9 with wins also for Vicky Lloyd-West, Julie Reilly, Ellie Cowell and Maureen Lacey. Celia Joughin claimed Marown’s only win and prevented a whitewash winning 21-3. The final score 108-91 (5-1). Next week the crunch tie between Port St Mary A and Peel Sunset will define the league standings. Peel Sunset are 79 points ahead of their rivals but Port St Mary have a game in hand so Peel must look to extend their lead. 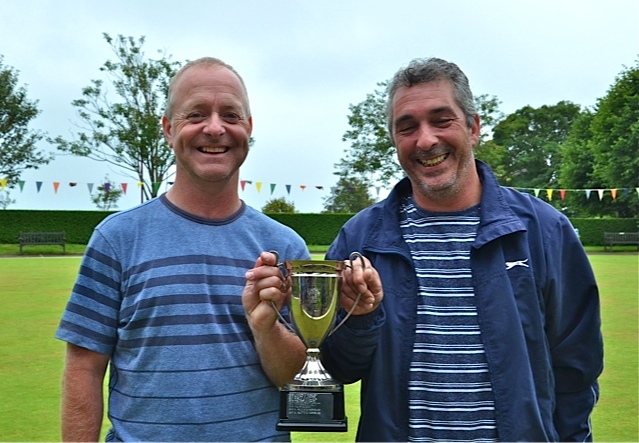 24 pairs competed for The Onchan Commissioners Any Combination Doubles Cup on Sunday 12 August. Perhaps the surprise result from the first round was the defeat of defending champions Stefan Kelly & Glynn Hargraves to Eddie Carlyle & Nathan Hamilton 14-21. The latter would come unstuck in the quarter final to David ‘Dido’ Kelly & Ryan Hargraves. In the other quarters, an all South Ramsey contest would see Jenny Moore & James Teare see off George Brew & Alan Moore. Matthew Quirk & Jordan Cain (Onchan) would succumb to Walter McCarthy & Colin Kelly whilst Trevor Quayle & Lyn Bolton (Port St Mary/South Ramsey) would be seen off by Kevin Quirk & Steve Parker. The losing semi-finalists were David ‘Dido’ Kelly and Ryan Hargraves & James Teare and Jenny Moore. The final saw home greener Kevin Quirk team up with North Ramsey’s Steve Parker against the Marown pair of Colin Kelly & Walter McCarthy. Quirk & Parker were quickest to find their touch racing to a 14-6 lead after the first five ends. The seventh end, however saw a change in fortunes as Kelly & McCarthy took two followed by a further seven points over the next four ends to lead 15-14. By the 17th end their lead had extended to 19-16 but a disappointing lead allowed Quirk & Parker to take a maximum four. With rain starting to fall, Kelly & McCarthy held their nerve to take two & run out 21-20 winners. A big thank you was made to all those that helped with refreshments & the green keeper for providing, probably, the best green on the Island at present. It was also pleasing to see so many people stay behind to watch an enthralling final. 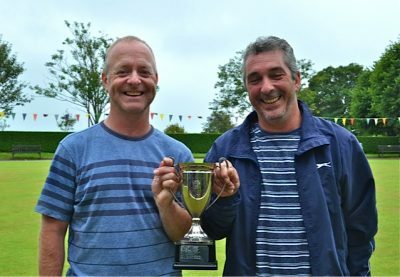 The South Ramsey duo of David Bradford and John Kennish added yet another title to their ever growing CV of open wins when they came from behind to beat Janet and Robert Monk in the final of the Ken Parker Trophy Any Combination Pairs held at the Mooragh Park and hosted by North Ramsey Bowling Club on Saturday. 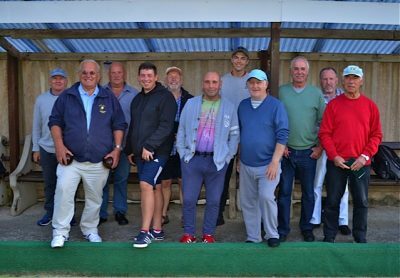 With a running green and the forecasted rain holding off until just after the conclusion of the competition, it was a good afternoon of bowls enjoyed by the twenty four pairs that entered. Fallers at the quarter final stage were Onchan pairing of Kevin Quirk and Adrian Skinner, home greeners Tony Smart and John Cannan, southern couple Tom Kelly and Sam Aherne and North and South Ramsey pairing of Steve Parker and Alan Moore. 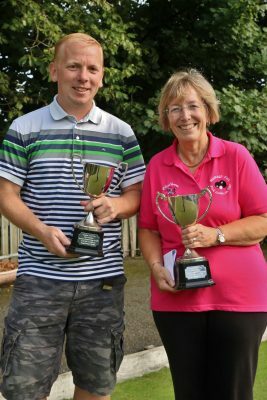 In the semi-finals Bradford and Kennish dispatched fellow South Ramsey club mates Jenny Moore and Lyn Bolton while the North Ramsey/Onchan mother and son combination of Janet and Robert Monk saw off the spirited challenge of young Madison McMullan and Lee Christian from the home club. It is worth mentioning that 12 year old Madison bowled well all afternoon with a maturity beyond her years. In the final the Monks raced in to a 14-8 lead and looked favourites to retain the title they won last year, but Bradford and Kennish clawed their way back and ran out 21–15 winners. The presentation was made by Steve Parker who gave a few words about his father Ken Parker who was a member of both North Ramsey and South Ramsey Bowling Clubs. Steve also thanked everyone who entered, along with those who helped with the running of the competition. The prizes were then presented. Marown currently lead the way in Group A with six points after three games, courtesy of winning all five singles games and the three doubles game at home to Finch Hill, who sit bottom of the table in Group A with no points having played four of their six fixtures in the group. Marown look clear favourites to top the group with the squad at their disposal, however they still have to face Peel at Crosby, along with Port St Mary home and away to progress. Group B has opened up nicely with Onchan sitting top having played three games. Despite Onchan suffering two heavy defeats in the singles games they pulled enough points back in the other games to secure the victory by just four chalks against Douglas. Onchan travel to South Ramsey for their next fixture. Once this fixture has taken place this will give a better idea as to who will go through in the group, with it becoming clear in this format that a lot depends on the draw as to which players get drawn in the singles and the doubles. South Ramsey slipped to defeat at North Ramsey losing out by 18 chalks to earn the two points the Mooragh Park men, with Brian Colquitt and John Cannan inflicting single figures defeats in the singles games on their opponents Ian Moore and James Teare.